Order one for each DC office and location to be fully compliant. 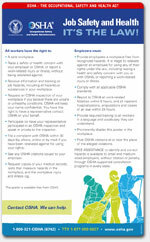 The OSHA poster is included on the District of Columbia Complete Labor Law Poster. When you order the District of Columbia Complete Labor Law Poster, it will satisfy your State, Federal, and OSHA posting requirements with one poster. 03/2019 - DC Paid Family Leave - Completely new poster for the DC Paid Family Leave Law that explains which explains who is covered by the law and how the program works. 04/2017 - Minimum Wage Poster - Updated with new minimum wage rates effective from July 1, 2017 to July 1, 2020 and revised minimum wage and overtime exemptions. 05/2015 - Protecting Pregnant Workers Fairness Act - Update includes new poster "Pregnant Workers Fairness Act" requiring pregnant workers be given accomodations at place of employment. 03/2015 - Wage Theft Prevention Act - Updated Wage Theft Prevention Amendment Act now provides provisions to penalize employers who do not pay earned wages, effective February 26, 2015. 03/2015 - Equal Employment Opportunity - Updated with minor format changes. 03/2015 - Parental Leave Act - Updated with minor format changes. 04/2011 - Non-Discrimination in Public Accommodations - Updated to reflect the current mayor. 04/2011 - Government Employee - Update made to content. Many industries such as the restaurant, retail, construction, and professional use the District of Columbia Complete Labor Law Poster to satisfy their compliance requirements for State, Federal, and OSHA. When posted in an area frequented by employees, the District of Columbia Complete Labor Law Poster puts a business in full compliance. Federal contractors and subcontractors are required to display more postings in addition to the general State, Federal, and OSHA regulations. Please click here to see the federal contractor and subcontractor posting requirements. Ensure your full compliance by posting the District of Columbia Complete Labor Law Posters with the federal contractor-required postings.